This morning a group of us vintage gals, and guys too, got together for brunch at one of Portland’s swankest restaurants, Gracie’s. As always, we had a theme…today’s theme? Bakelite and Bowties. I’m loving that we’re coming up with more co-ed friend;y events. It’s so nice to see men all dapper…even if we only had three. We enjoyed brunch while basking in the glow of crystal dripping chandeliers as we chatted while our bangles clicked against each other. It’s so delightful getting together with people who “get” things such as Bakelite. Like Solanah of Vixen Vintage toted a gorgeous very wide carved piece that she paid only $60 for! How amazing is that!? And all of us oo’ed and aww’ed over such a steal, while the average person would say “You paid $60 for a hunk of plastic! ?” So, needless to say, I adore my vintage crowd. Thanks for being in Portland, ladies! Cal-Anita Expressing for Miller’s Jacket: Thrifted by my dad! I love the way you pulled together the greens, oranges, and beiges in your outfit… BEAUTIFUL, as ever. These pictures are fabulous. I love that you were able to include your hubby in the mix. How fun and wonderful! I don’t own much in the way of Baklite but there are many pieces I’ve wanted too:) What a fun time! Green is certainly your color and I just love your hat. Ooh your outfit is perfection. I adore your necklace and all that bakelite is simply swoonworthy! You all look absolutely fabulous! I adore your dress – and yes Solannah’s bangle was a total steal at that price!!! *PS* Love (!) both you and Patrick’s ensembles. So elegant, stylish and beautiful/dapper. I love those arms full of bakelite! SO, SO GREAT! I really wish we had things like this where I live! You all look wonderful! I love the colors of your outfit, so lovely! What a gorgeous outfit. Lovely springtime colours. Love the men’s shoes too. This looks like so much fun and you all look fabulous. I love that shad of green on you and the “she loves me” bow-tie is amazing! What fun! You look so pretty, love the little pockets on the dress, and the hat. Your hair looks pretty, the curls look very cute. It looks like you had a great get-together. I keep wishing I could get up to Oregon to meet all of you lovely people before I take off for the other side of the country. I’m pretty sure I have those identical shoes, also bought at Payless, probably about 6 years ago! They are super cute; unfortunately, I don’t find them very comfortable so I don’t wear them very often. They put my foot at a rather awkward angle. 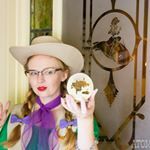 I love that you have a little vintage community in your area and do themed get-togethers! I don’t really know anyone in my area who loves the vintage lifestyle as much as I do, which is one of the reasons why I recently started my own blog – to perhaps meet like minded people. It was so lovely to see you again, and your outfit was adorable. Loved the dapper gents, as well, and the chance to meet Patrick! You two are such a cute couple. So jealous; you all look so amazing! What a sharp looking bunch.Especially love the guys’ coold shoes.